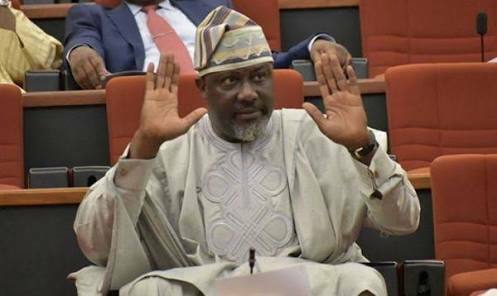 The move to recall Senator Dino Melaye (Kogi West) from the Senate has failed as only 5.34 per cent of the total 188,500 signatories to his recall petition were verified in an exercise held on Saturday. According to the Independent National Electoral Commission (INEC), the result of the verification showed that 39,285 of the signatories were verified, out of which only 18,762 signatures were genuine. The genuine signatories represent a dismal 5.34 percent of the total signatories to the petition, which fell short of 51 percent or 98,364 signatures required for the petition to sail through. The Nation reports that it was observed that the verification failed largely due to fictitious and forged signatures and names of dead persons affixed to the recall petition by its promoters. Some electorate in the Kogi West, on June 24, 2017, submitted a petition to recall Melaye to the headquarters of the INEC in Abuja. One Mr. Cornelius Olowo led the petitioners to submit the recall petition which alleged poor representation as one of the reasons for the move to recall Melaye. However, the INEC’s presiding officer for the verification exercise, Prof. Okente Morthy of the University of Abuja, said the number of signatures verified fell short of the number required. Kogi State Chairman of All Progressives Congress (APC) Alhaji Haddy Ametuo said “some ghosts” initiated the recall process against Senator Dino Melaye. Ametuo, who stated this in a statement issued in Lokoja yesterday on the botched recall process, expressed delight that the efforts had come to a premature end through the collective will of the people of Kogi West Senatorial District. Melaye, however, thanked the people of his constituency for “rising to his defence” by shunning the verification exercise. He also expressed gratitude to the media, observers, civil society groups, security agents and other stakeholders “for resisting to be used against the wishes of the people of his constituency”.